Where’s Wallis? 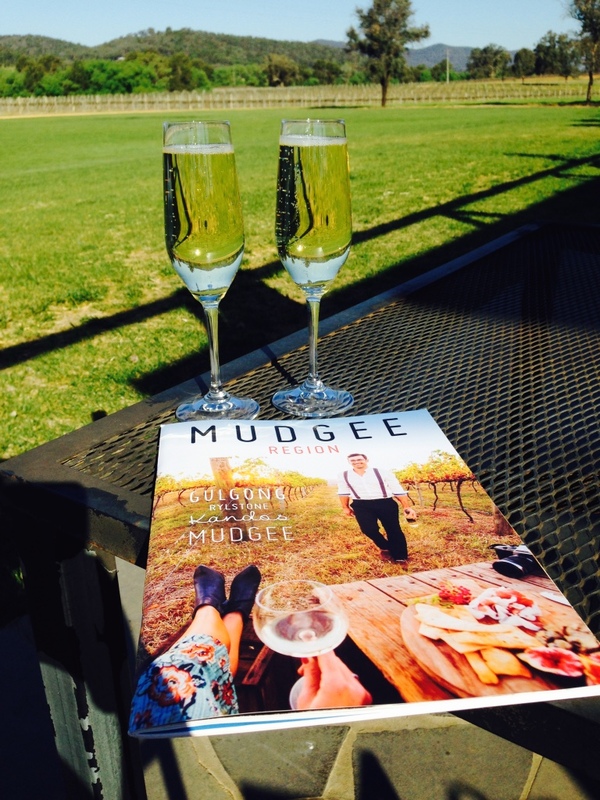 Mudgee, NSW, Australia – Where's Wallis? So, the story goes…on our first date Ben and I went to a dinner at the Apprentice restaurant as part of Pymont Food Festival. It’s the restaurant where budding chefs at the TAFE train and we had a delicious dinner with matching wines from Bunnamagoo Estate, Mudgee. Robert Black, the winemaker from Bunnamagoo, was at the dinner presenting the wines, and after a few glasses of fizz Ben and he somehow came to an arrangement that we’d come and camp on the vineyard one day. He probably thought (hoped) that those tipsy diners would have forgotten all about it by the next morning, but after a few more dates, when the Sydney winter had passed and the October long weekend was upon us, we thought it would be the perfect time to see if the offer still stood. We were delighted when we got an e-mail back saying that they’d be happy to have us! To avoid the Friday night long weekend traffic out of Sydney we set off at about 6am on Saturday morning, flew through the city and by the time we made it to picturesque Belpin by 8am we were ready for breakfast. 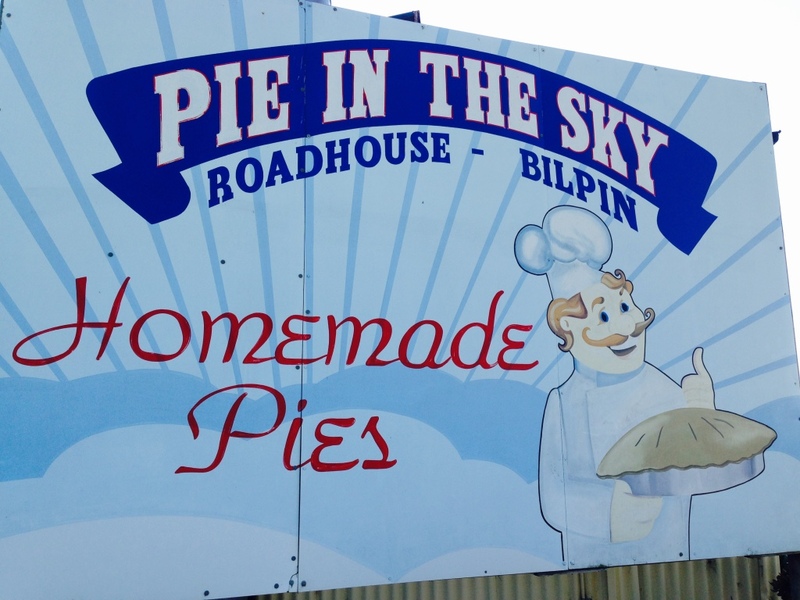 Sadly, the famed ‘Pie in the Sky‘ wasn’t opening until 9am, but we found ourselves apple pie and icecream at ‘The Pines Orchard’. 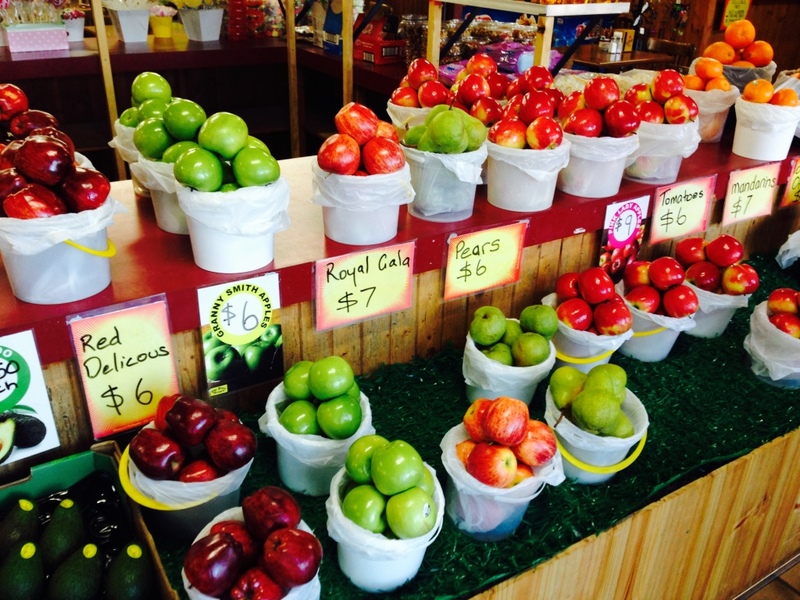 And the famous apple pie! 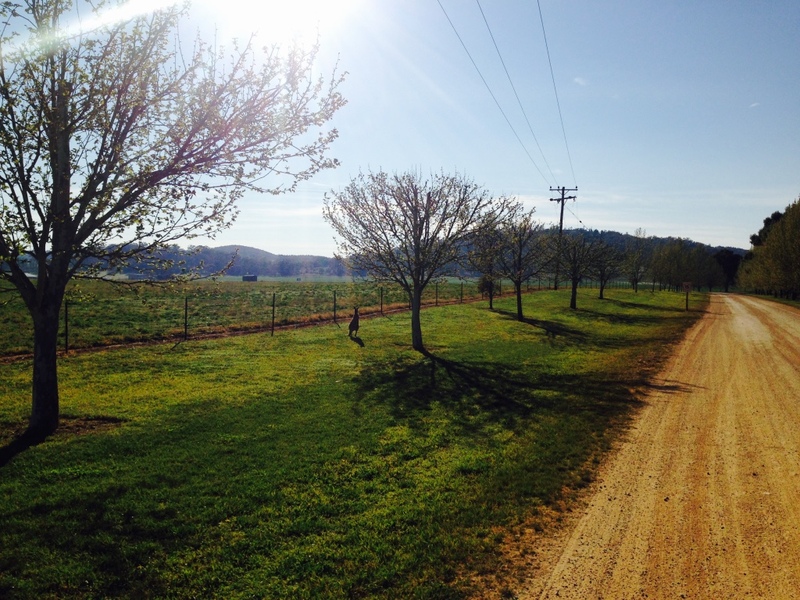 We arrived in Mudgee late morning and explored the town. En route it had become apparently that the only thing we’d managed to pack properly was a cool box (‘eskie’ / ‘chilly bin’) and had neglected to bring any bedding. We’d had ambitions of creating a ‘glamping’ experience: the air bed with clean sheets, a big duvet and lots of pillows. What we managed to bring was: the air bed, and 1 sleeping bag. Not entirely sure how this happened but we were lucky that there was a homeware shop in Mudgee for us to buy the cheapest duvet cover to sleep inside! 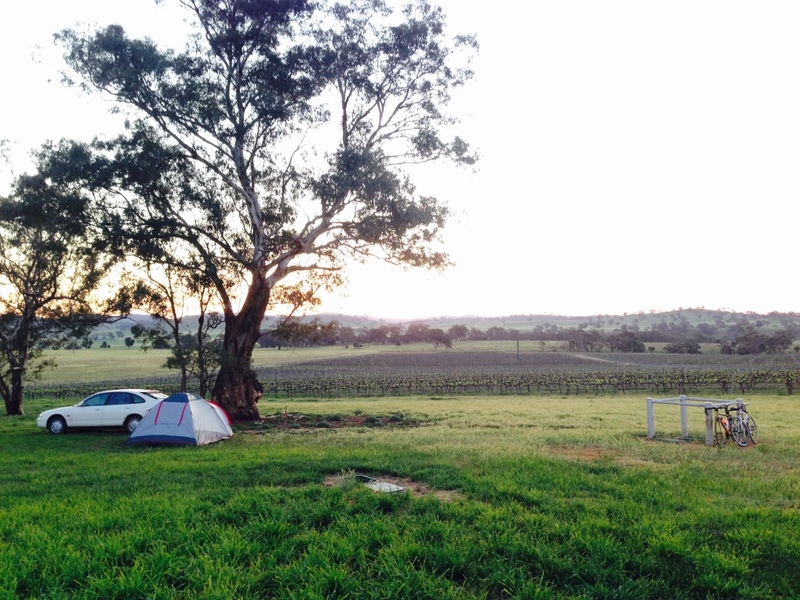 We also didn’t realise that it got down to c 5 degrees at night in Mudgee. Grossly unprepared. 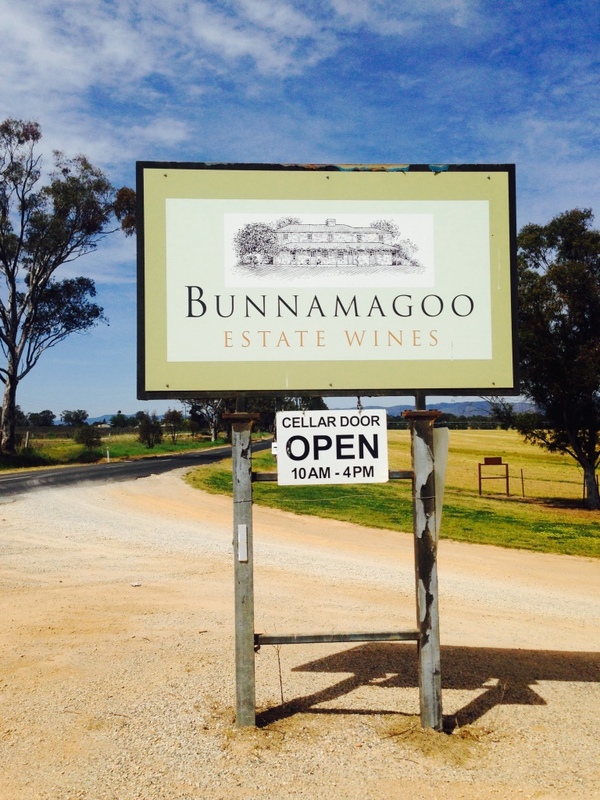 Once the bedding was purchased we drove the 10k out of town to Bunnamagoo where were greeted by the lovely Linda at the cellar door. Beau, the estate manager then took us for a drive around the vineyards and showed us a couple of spots where we could pitch the tent. 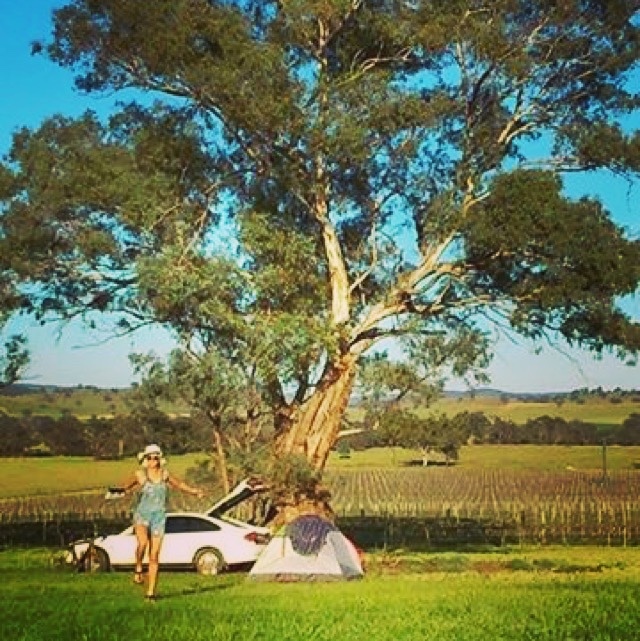 Tent first, or wine first? Being super sensible we opted to get the tent sorted, which was probably an excellent idea, as inflating an air-bed after a few glasses could go rather wrong. Tent built, we headed back to the cellar door to sample the Bunnamagoo wines and ended up getting a bottle of their sparkling pinot noir chardonnay. It would obviously have been irresponsible to drive into town that night…..so we cycled (!!) We had pizza at Roth’s wine bar where there was some live music and we also bumped into Blackie there and caught up. The next morning was the England v Australia match in the rugby world cup, so we dragged ourselves out of the tent at 5.30am (which was really 4.30am as the clocks went forward!) and drove back into Mudgee to The Oriental hotel, which had opened early especially. It was full of Wallabies fans (obviously) and when one man walked in in an England shirt he was solidly booed by the entire pub. So I just kept my voice down…not that there was a huge amount to shout about during the game! In fact the highlight was probably the sausage sizzle put on by the pub at half time! 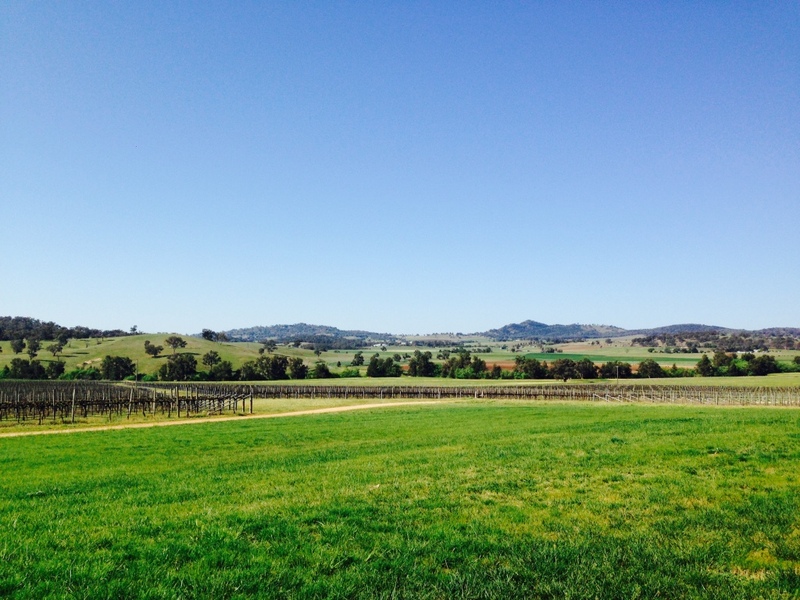 Match over, and England out of the world cup, we had a Sunday in Mudgee stretching ahead of us 🙂 It was only about 8am by the time we drove back into Bunnamagoo and there were 2 kangaroos bouncing alongside us along the drive…genuinely! 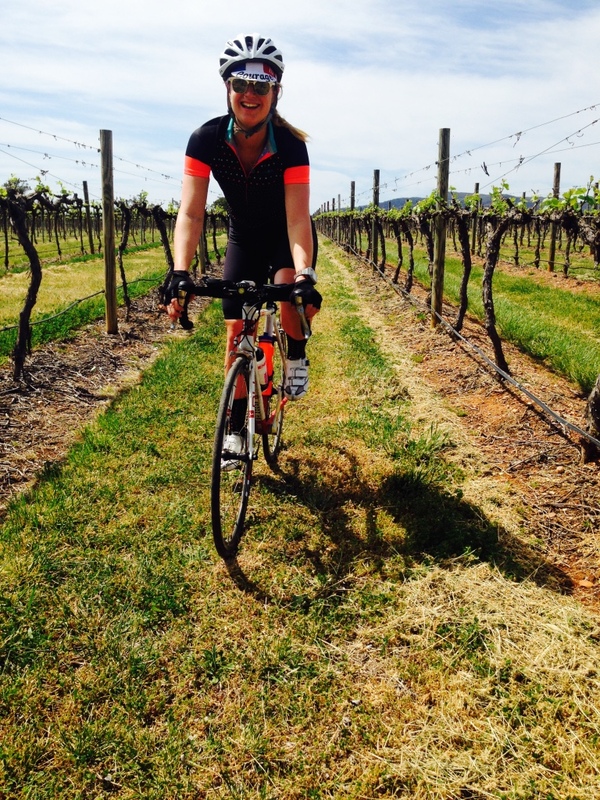 We got on the bikes and set off around the vineyards. 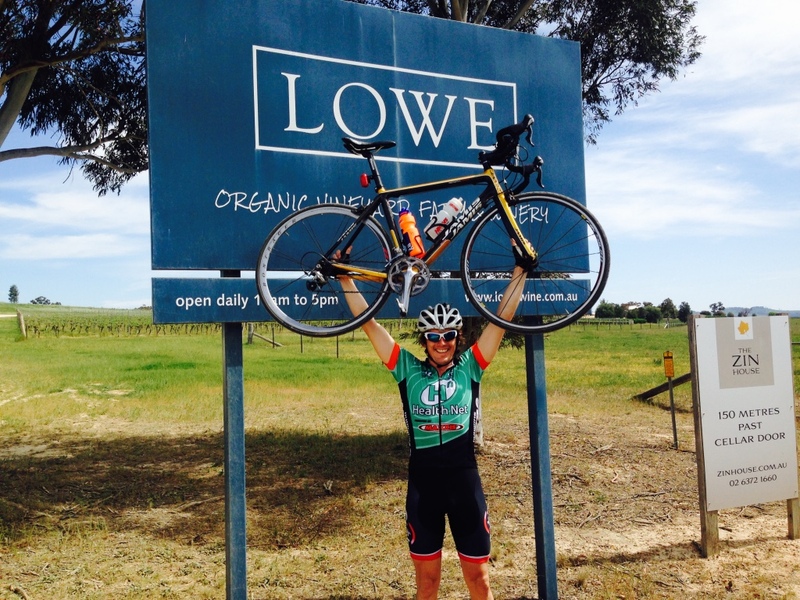 First was Ben’s namesake…Lowe wines. This is a fully organic, biodynamic vineyard, and I’ve honestly never seen a place as teeming with wildlife as the front garden. There were beautiful flowers and bees everywhere! 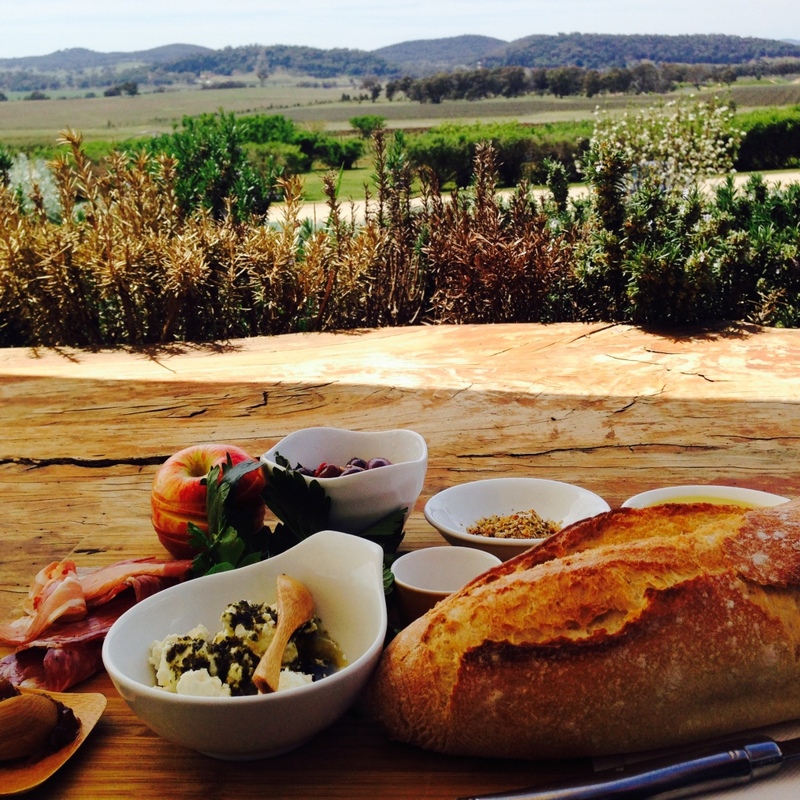 They did a cracking platter, and we just got a couple of glasses of wine and sat out the front facing the vineyard as the tasting room was packed with people. Nothing matters when you’ve got a good platter! A local dog decided to befriend us and follow us about half a mile down the drive. We almost turned back to return it to Lowe’s when a truck pulled up and the owner collected it! 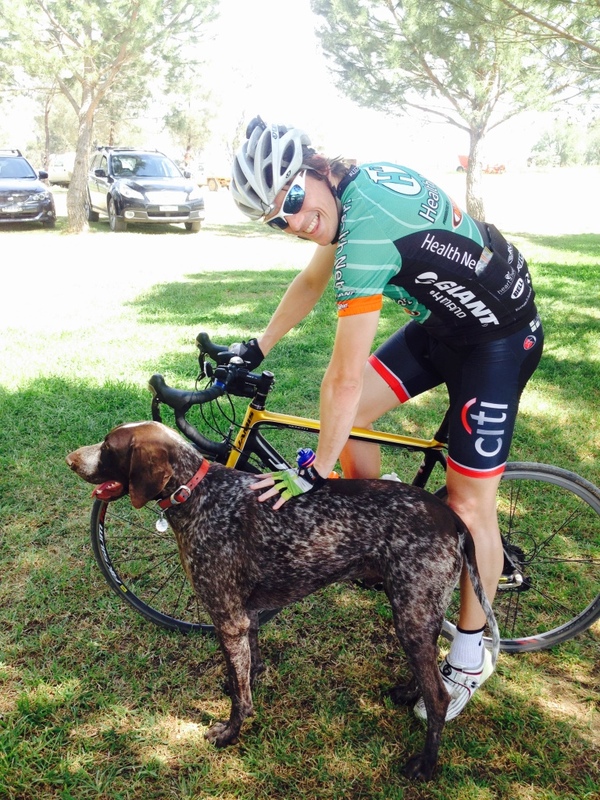 This was not the only animal acquaintance that we made during the day…so you see people cycling around with cable ties on their bike helmets pointing up to the sky. “Don’t they look silly” you mock. But OH NO, they have the last laugh…the cable ties act as magpie deterrents and without them you get swooped when cycling under their trees! There were a few terrifying moments when we were both targeted by mad magpies and because it was sunny all you could see was a winged shadow on the road bearing down on you and had to cycle waving our hands above our heads until we’d cleared their territory! This definitely called for more wine! Next we popped into Di Lusso estate which was packed with lunchtime diners. We got a bottle of fizz and they gave us a picnic rug to go and sit down by the lake. Ben saw this as the perfect opportunity for a siesta so I happily worked my way through the wine. 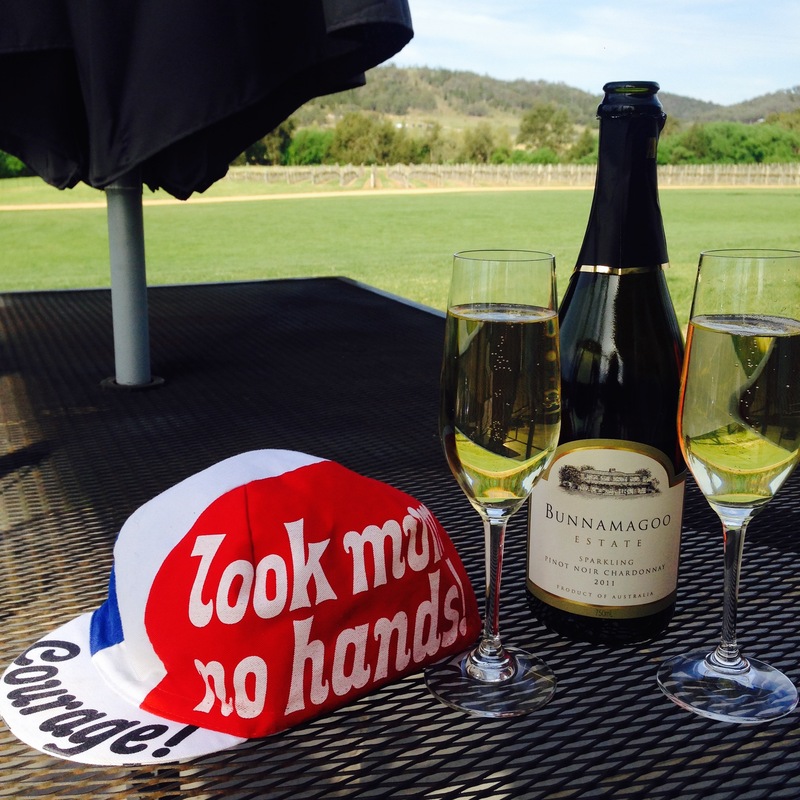 Finally we wobbled back to Bunnamagoo to have another sundowner Pinot Noir Chardonnay (our favourite), chat to Linda and her husband Bob, read, and play badminton down on the lawn. 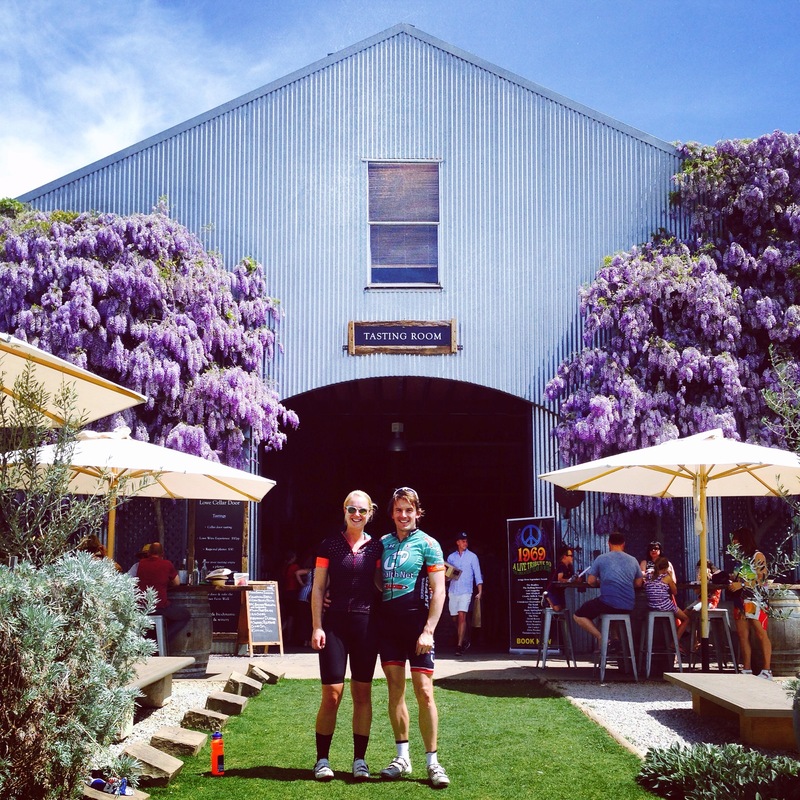 It was an awesome day, and reminiscant of our tandem wine tour in Blenheim, NZ , just marginally less wobbly. 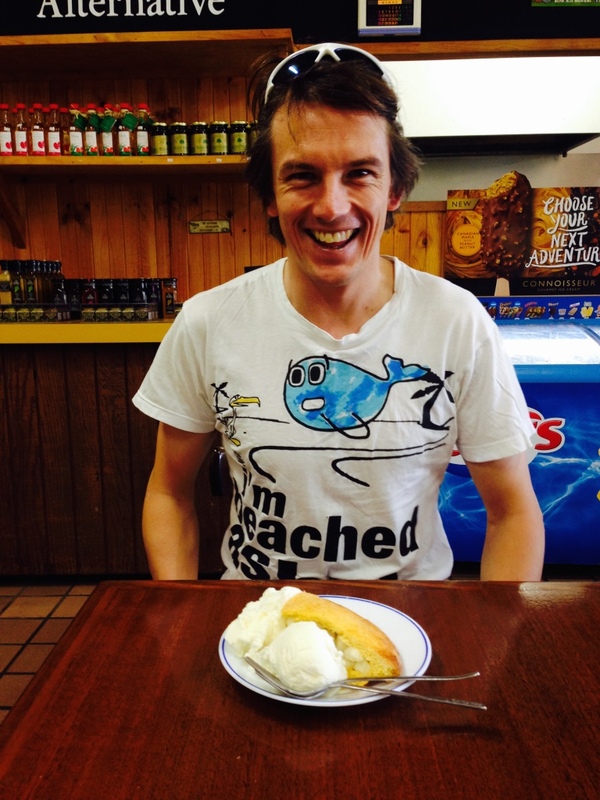 That night we drove to the other nearby town of Gulgong for an Indian at Haldi. We were planning to cycle again as we’d heard that Bunnamagoo was ‘halfway’ but lucky we checked as it was actually 20k from Gulgong, so a 40k round trip for dinner, on a dark country road, would have been rather ambitious! Monday we had a lovely relaxed morning up on our deserted patch of land. Our kangaroo friends were back for a look around. I wanted to get closer to them so Ben kept telling me to “be smaller! !” so that I didn’t scare them. Of course they ran away as I wasn’t very good at being smaller! We were so sad to say goodbye to Bunnamagoo. Blackie and Linda and Bob were all SO welcoming. Luckily we’ve brought a good stash of wine home to see us through to the next visit! They run a ‘Polo in the Paddock’ event at Bunnamagoo and also ‘Mudfest’ short film festival, so we’ll definitely be heading back there at some point. Pingback: Where’s Wallis? 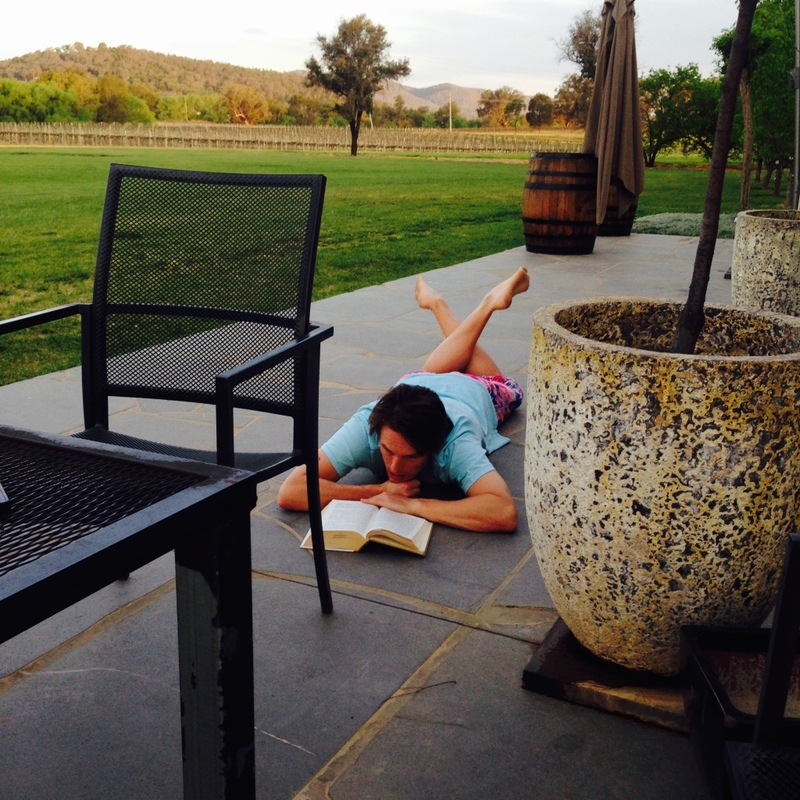 Central Otago, South Island, New Zealand | Where's Wallis?